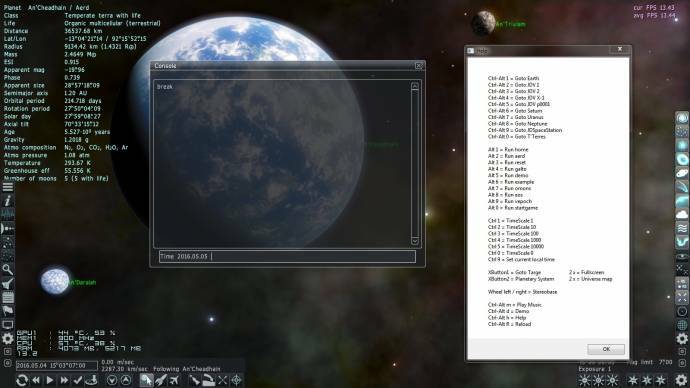 Forum » SpaceEngine » General Discussions » Cool Console Commands? I was just wondering, are there any interesting uses for the console. Right now it seems pointless. Maybe there are some fun things to do with it? a partial list of console commands and an example script that can be used with is in your SpaceEngine docs/ folder, named scripts.txt and console.txt. There are actually quite a few useful things you can do with the console. Many addons I have worked on would have been useless or extremely difficult without the console so it is far from pointless. There are also engine adjustments you can make through the console which are good for screenshots and debugging. I use a AutoHotkey script for additional keyboard and mouse commands. The list shows the currently available commands. To run these commands, AHK opens either the F3 window or the console, adds a command, operated the Enter key and closes the window.